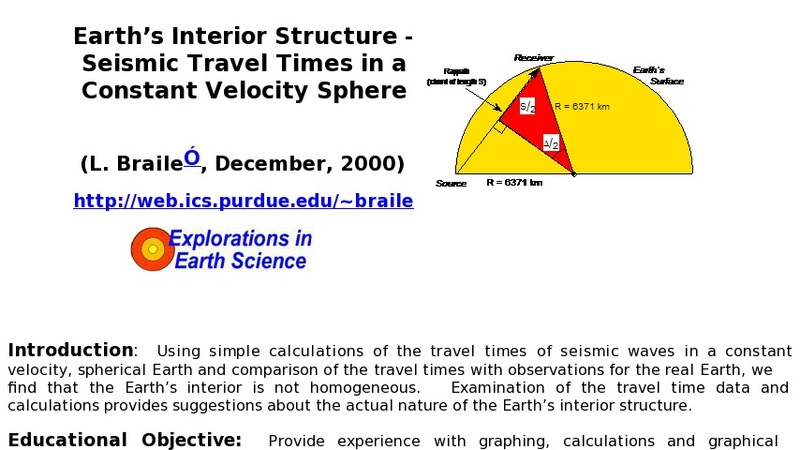 In this activity, students use simple calculations of the travel times of seismic waves in a constant velocity spherical Earth and compare these with observations for the real Earth. They find that the Earth's interior is not homogeneous. The exercise provides suggestions about the actual nature of the Earth's interior structure. This activity will provide experience with graphing, calculations and graphical analysis. Students will also infer the structure of the Earth's interior and gain experience with the methods used to study Earth structure. In addition, the activity could provide an opportunity to make calculations using a calculator from an equation, or to write a computer program to perform seismic travel time calculations. Detailed instructions and calculations are included along with the required worksheets.